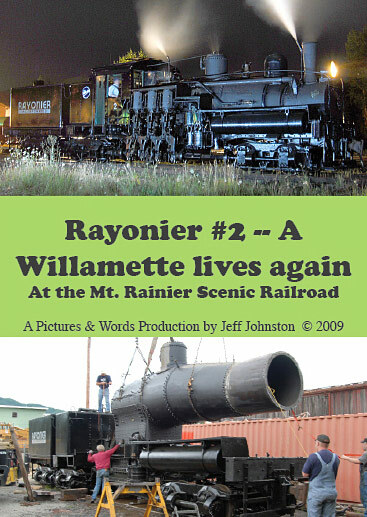 Rayonier employee Jim Gertz purchased Rayonier #2, a Willamette geared locomotive, from his employer when steam was giving way to diesels on the company's Clallam (Sekiu, Washington) operations. Jim hauled the loco to his home, built a shed around it and there it slumbered in safety for several decades while awaiting a return call to action. In January 2008, the shop crew at Mt. Rainier Scenic Railroad in Mineral, Washington, began the daunting task of restoring the #2, one of only six Willamette steam locomotives in existence to operation. Under the guidance of General Manager Brian Wise, the expert crew painstakingly brought the locomotive back to good-as-new condition. Jim Gertz saved the locomotive from the scrappers, and the MRSR crew brought it back to life again. This video is a look at that story. In addition to views of the Willamette during its media introduction, its first scheduled public run day and a Santa Claus train, there are also segments on a behind-the-scenes shop visit during the rebuild and some commentary from Jim Gertz. A portion of the proceeds from the sale of this DVD support the steam preservation efforts of the Mt. Rainier Scenic Railroad. Total run time, about 60 minutes. US shipping is an extra $5 per DVD.